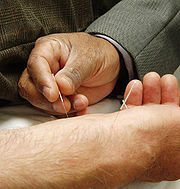 To prevent infections transmitted by acupuncture, infection control measures should be implemented, such as use of disposable needles, skin disinfection procedures and aseptic techniques. Acupuncture may be risky as needles are inserted up to several centimeters beneath the skin. In the 1970s and 1980s most infections associated with acupuncture were sporadic cases involving pyogenic bacteria. There is a new syndrome - acupuncture mycobacteriosis - infection caused by mycobacteria that rapidly grow around the acupuncture insertion point as a result of contaminated cotton wool swabs, towels and hot-pack covers. There is a long incubation period and the infection usually leads to large abscesses and ulcers. Acupuncture transmitted infections. BMJ 2010;340:c1268. Acupuncture can spread serious diseases: experts. Reuters. Image source: Needles being inserted into a patient's skin, Wikipedia, public domain. @jeisea: I've only had YNSA and new needles in sealed packs are used. No heat or cotton wool etc.